An oyster lives in a very nutritious house: its shell. Nutritious for us, that is. This is due to the fact that an oyster shell is similar in substance to human bones. And it comes from the sea, thus is naturally bursting with minerals. Known in Chinese medicine as “mu li,” oyster shell contains a bounty of nutrients, most prominently calcium. Others include copper, cobalt, phosphorus, manganese, zinc, magnesium, potassium, chromium, iron, selenium, molybdenum, glucose, taurine, and vitamins A, B1, B2, D, and E.
Chinese herbalists know of this “herb” more than anyone else, and they describe it as having cool properties. It is directly linked to the liver and kidneys. Oyster shell is believed to calm the liver, focus the mind and soften any unusual “hardness” found in the body. Due to its high calcium content (including several types of calcium), oyster shell could strengthen bones and help prevent and treat osteoporosis. Since bones are critical parts of joints, this helps stabilize joints as well and prevent arthritis. But the extraordinary level of nutrients in it suggests that oyster shell may have many assorted abilities in the human body. It could help fight cancer. Taking fresh oyster flesh mixed with dry oyster powder could significantly aid cancer patients who are undergoing radiation. The herbal addition could increase the radiation’s effect in killing tumors — by as much as 52%. Elsewhere, a study found that tumors in the liver could be reduced and immune cells empowered. It could boost immunity. Chinese researchers have found that oyster shell could significantly boost the number of immune cells in your body, including “natural killer” cells that are your body’s best defense against invasion. This means it’s great in helping prevent colds and flu. It could prevent stomach ulcers. 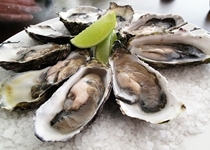 Oyster shell has a significant effect in preventing gastric ulcers, most commonly felt during bouts of indigestion. A typical dose ranges from 10 grams to 30 grams, decocted in water. The dose can increase or decrease depending on the condition being treated; it’s best to consult a doctor who understands this herb. It is sold as powder, or pills. Ready-made “decoctions” are available at specialty stores and Asian markets. If you are experiencing constipation or upper stomach pain, the dose is too high or you’ve been taking it too long.